THE funeral of PC Andrew Duncan in Molesey on October 11 was an event that will live long in the memory of our town. Residents who lined the streets witnessed the spectacle of hundreds of police officers - including at the highest levels of the MET - arriving at St Mary’s Church to pay their respects. So great were the numbers that the church could not accommodate all the mourners, and a marque had to be set-up in the car park close by. Andrew tragically died as a result of doing the job he loved, when he was struck by a hit and run driver while on duty in Sutton. He was 47-years-old and leaves behind a wife and two children aged 17 and 14, whom he doted on. Although the MET regarded Andrew as one of their own, he was first and foremost a son of Molesey, having grown up in Matham Road and attended The Orchard and St Lawrence schools. He continued to live here after he was married. Andrew had a lifelong association with the scouts, and followed in the footsteps of his father John Duncan who has been a leader with the 1st Molesey Scouts on and off for 60 years. As a boy Andrew accompanied his parents to scout camps, before joining aged eight. As a Sea Scout he found his passion for the water, while on land he was fond of motorbikes. 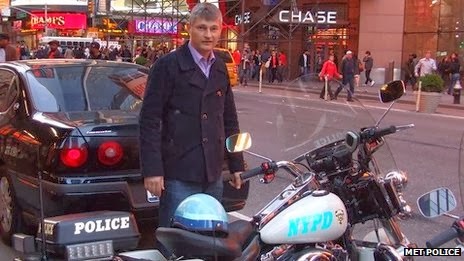 He is pictured (above) on a family holiday to New York posing beside a police motorbike. His dad John thinks the values of community and service which Andrew learned from the scouts probably persuaded him to join the police. He started on the beat in Battersea in 1990 and had served as a traffic officer since 2004. His family will be launching a memorial fund in his name to raise money for local projects. They are assembling a team of Andrew’s family, friends and scouts to run the inaugural Hampton Court Half Marathon on 23 February 2014 and have a host of events planned. The Molesey Conservatives would like to extend our sincere condolences to Andrew’s family and friends.